In a surprise move, an Australian conservation group, Coast and Country, has announced it has filed an appeal to the Supreme Court of the Queensland province for a judicial review of the environmental clearance granted to India’s powerful Adani Group’s $16 billion Carmichael coalmining project, proposed to be implemented in the Galilee Basin. The Queensland Department of Environment and Heritage Protection gave a go ahead to one of the world’s biggest coalmining projects, handed over to the Adanis, on February 2, following which the indigenous groups – which were earlier opposing the project – heavily voted in its favour. “Coast and Country has taken this step because the department failed in its obligations under the Environmental Protection Act to consider ecologically sustainable development”, said Derec Davies of Coast and Country. “Our appeal to the Supreme Court is simple. We have laws to protect the environment that we rely on for our food, clean water, and the air we breathe; and that supports our unique biodiversity”, he added. “In our opinion”, Davies further said, “The Queensland Department of Environment and Heritage Protection has made an error of law. The department cannot just ignore those laws and allow the big end of town to develop a huge, polluting coal mine that will create catastrophic environmental harm both now and into the future”. “What is most concerning is the fact that it failed to properly consider and apply the legislation under which it operates”, he added. “The requirement to consider ecologically sustainable development is nothing new. All developments approved under the Environmental Protection Act must be scrutinized using this principle since 1994. This principle is the community’s safety net”, Davies insisted. “It ensures proposed projects meet a core set of criteria designed to protect ecological processes essential to life, and it is agreed to by the Australian Government as set by the United Nations”, he said. “This pollution will cause our oceans to acidify and warm further, potentially destroying our precious reef”, it said, adding, “Our case, and our resolve on this matter, is clear. The law is the law”. 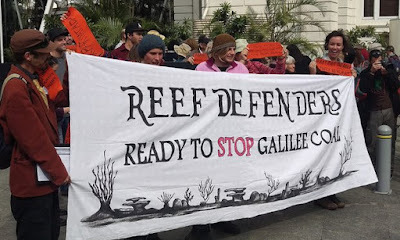 Coast and Country is represented by lawyers from the Environmental Defenders Office Queensland, an independent non-profit community legal centre specialising in public interest environmental law. Quite right: every site specific decision must consider the precautionary principle and intergenerational equity.